Newly decorated 2nd floor unit is open and airy with a tropical feel. The first floor private entrance leads up to the large living room with cathedral ceilings that immediately say, 'Welcome to Paradise!'. 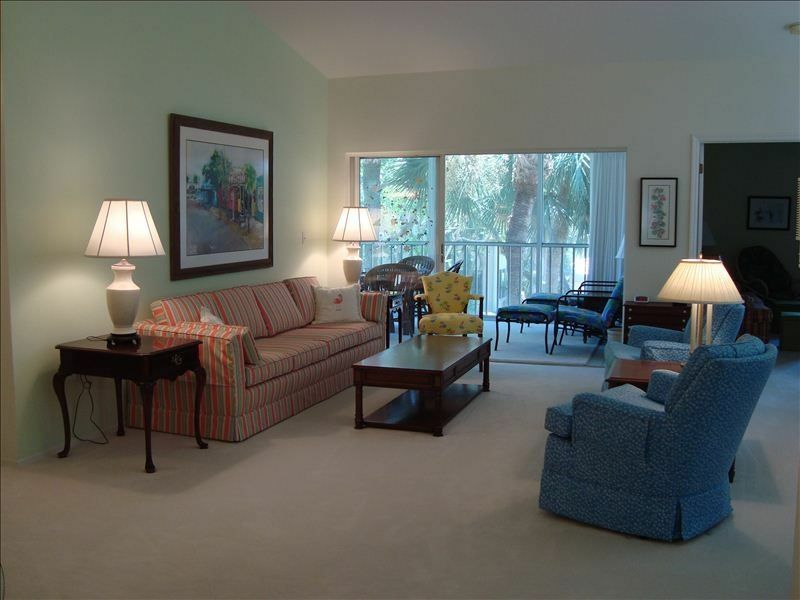 The lanai is surrounded by lush trees which provide a private, relaxing place for eating and entertaining. The air-conditioned lanai is screened in with sliding glass doors for year-round use. Just off the living area, is the den with a queen size sleeper sofa, additional seating, a television and ceiling fan. Minimum of 3 months to lease, subject to condo association approval. The master bedroom features a king size bed, a sitting area, a television and a ceiling fan. The master bath includes double sinks, a separate shower and a jetted tub. The guest room has two twin beds. Both bedrooms have large closets and plenty of dressers and chests for all your clothing. The kitchen has all new appliances and is fully equipped for all your entertaining needs. The condo also has a full-sized washer and dryer and 3 bicycles available for your use. Enjoy all the amenties of Pelican Bay. Trams (large golf carts) provide free access to the two private beaches. Beach facilities include restaurants, lounge chairs, umbrellas, showers and bathrooms. Sailboats, kayaks and canoes are available to explore Clam Pass and the Gulf. A new fitness center offers state-of-the-art workout equipment and numerous classes. Check out Pelican Bay's website, listed below in the 'Links to more information' section, to see all that Pelican Bay has to offer. We would move to Naples if our children would allow us to, but for now we settle on visiting when their schedules permit. Fortunately for you, that is not very often anymore, so we have decided to lease our condo. Naples is paradise and Pelican Bay is even better! (2) Televisions are located in the master bedroom and den. Glencove amenities include a clubhouse with social room and kitchen, heated pool and hot tub. Pelican Bay amenities include 2 private beaches with dining facilities beachside, shuttle trams to and from the beach, tennis complexes with pro shops and leagues. Glencove is within walking distance to the Philharmonic and Waterside Shoppes.